P.S. There’s always something new on St. Barth and we all love shopping at the “all-new” Oasis Market. Read all about it in my Blog. 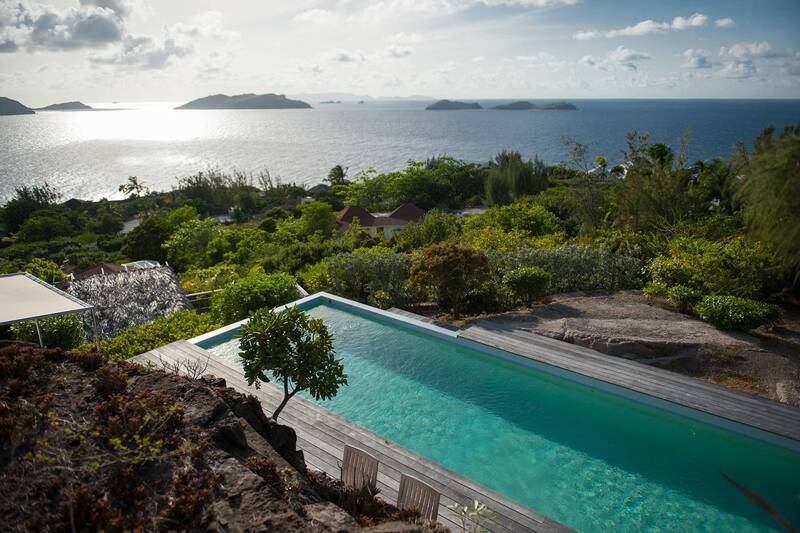 Located in Flamands, the lovely 3 bedroom Villa Shadowfax treats guests to views of the sea, neighboring islands and lush green hills. Well laid out with soothing minimalist décor, it’s vacation-perfect, and a long, heated infinity pool sparkles in the sun. The villa’s sleek summer-white kitchen opens to an alfresco covered dining area. There are two French king bedrooms, and another with twin beds convertible to a king. Glass sliders open to a deck and frame a view of the sea, and they are also screened, providing the option of enjoying tropical breezes. Location bonuses include proximity to the beloved neighborhood bakery La Petite Colombe for breakfast pastries or baguettes, or to pick up a sandwich en route to nearby gorgeous Flamands Beach. This stunning 2 bedroom villa is situated just so in Pointe Milou, boasting a three-sided vista of the sea and fiery sunsets. La Lune offers privacy, contemporary-styled sophistication and a wealth of special features. The living room is furnished for comfort, conversation and feet-up TV viewing, and an air-conditioned office area makes the space truly multifunctional. The chicly simple décor is complemented by a soothing custom-designed palette, and designer accessories add punch and panache. Elevated above the main level, a sleek kitchen and adjacent dining area open to a shaded porch and a spacious sunroom furnished for relaxing and dining. The views from here are particularly dramatic. A long solar-heated pool is the focal point of an expansive deck; an open cabana and a lower-level gazebo provide additional outdoor living space. Two equally sized air-conditioned master suites have king beds, smartly appointed en suite baths and glass sliders to decks overlooking the ocean. The doors and windows are screened, providing the option of enjoying tropical breezes and the sound of the surf. 8 pm – Fireworks and dancing on the dock. Wear your best Havaianas. The island’s annual rock festival has just announced a stunning international lineup. They’ll be appearing at venues throughout the island including La Plage, Le Sereno and the Christopher. 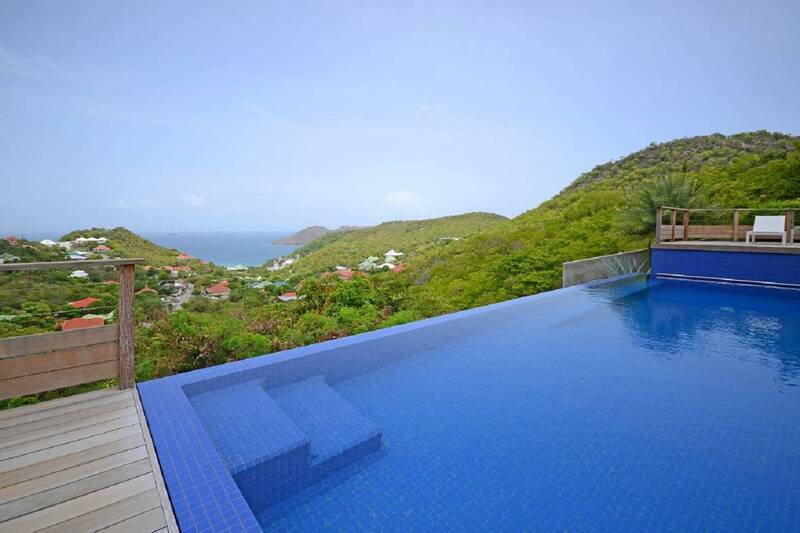 St. Barth Properties is pleased to be one of the sponsors. Their Facebook Page has all the latest updates. Come on down and rock out! Whether you’re an island newbie or a devotee, you’re sure to enjoy A Beginner’s Guide to St. Barth’s, posted on Vogue magazine’s online platform. We enjoyed working with the writer, Lindsay Silberman, and are as pleased as Ti- Punch with the recommendation and kudos on our portfolio of “palatial pads” and our service. We love our concierge team! Our island gérant (General Manager), Benoit Meesemaecker, continues to tally sailing honors. Last month he placed 4th in the Masters Class at Laser Worlds in Mexico and then came home to win (again!) the Heineken Light Caribbean Open Laser Championships. This September he’ll sail stateside in the U.S. National Laser Masters, and next year he’ll compete in the Laser Worlds in Croatia. This 5 bedroom estate offers stunning views of both Petit and Grand Cul de Sac. It features a well-equipped kitchen and indoor and outdoor dining space, including a gazebo with a BBQ. This is an ideal vacation home for those who love to entertain. The living area opens to an expansive sun deck with a lovely pool. Four bedrooms, with smartly appointed en suite bathrooms, are in the main house. A separate bungalow includes the fifth en suite bedroom, a living area and a kitchenette. Perfect accommodations for teens or guests. Price recently reduced to € 5,250,000. We had a terrific time. TERRIFIC! We totally loved Chimère. It was a 9½ on a 10 scale in my mind. The pool was a highlight for us...the gym was excellent; we used it three times. Views were great. The house was stocked better than any house we ever rented, and it made it very comfortable for us. Diving with Thierry Balaska (of Plongée Caraïbes) is great!